Vincent Lane is a photographer, the father of Summer, Wind, Penny, Trent and Jane Lane, and husband of Amanda Lane. Vincent appears only twice in the series, in episodes "Lane Miserables" and "Art Burn". Physically, he is taller than Trent, has black hair and a thin mustache. He was typically shown wearing jeans, a shirt with rolled up sleaves and a photographer's vest. He also smokes a pipe. Vicent and Amanda's constant absence from the Lane household in Lawndale is a recurring theme in Daria. Jane mentions it in passing during some episodes, though her parent's absence does not seem to upset her much. Vicent is usually mentioned as being in a photo assignement somewhere else other than Lawndale. Very little is shown of him from his only two appearances. In Lane Miserables it is shown that, despite Vincent's occupation, the Lane home apparently did not have a dedicated darkroom for his work, as he was using an upstairs bathroom to reveal photographs, while, at the same time, not being very concerned about chemical safety, leaving toxic photographic chemicals in the kitchen. Later in the episode, while talking to Wind, he mentions that he and Amanda try to work their marriage issues by role-playing and hitting each other with foam rubber bats. The music site Reburb says Vincent was "a big draw on the singer songwriter circuit of early-1970s Ann Arbor, Michigan -- see Daybreak Dreamin'". It was him who gave Trent and Jesse Moreno their first guitars (acoustic) and later told them what tuning was. He sold his photos of Celtic rocks on LaneBay. He shows some discontent with his work on that website: "An inspiring scene captured for eternity on film while I was standing knee deep in mud. My discomfort is your gain; connect with ancient civilizations while staying nice and dry and avoiding the onset of pneumonia. (But it was worth it, really!)" His first name, Vincent, was never actually said on-air, but was given on the MTV website for Daria. The Lanes' attitude towards parenting was described by Jane herself as "benign neglect." He was in a band once and gave Trent and Jesse Moreno their first guitars. TV Tropes.com has an entry - 'Hands-Off Parenting' - that was inspired by the Lane parents. Originally entitled 'Casa Lane Parenting', the entry was the 'trope namer' (and is the 'Most Triumphant Example') of the trope. 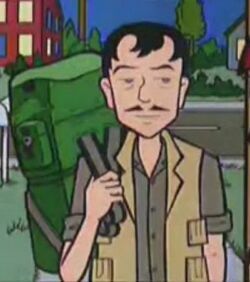 In Daria Fanfiction, Vincent is usually portrayed as an absent father, similar to his canon characterization, with Jane or Trent saying in passing that their father is working on a photo assignment somewhere far away from Lawndale (usually outside the USA) or that they do not know his whereabouts at all. The John Lane series, by Richard Lobinske, starts with Vincent and Amanda being found to be unsuitable parents and relinquish their parental rights to the Morgendorffers, thus setting the premise of the series. Vincent appears in John and Retouched Parents. In Daria's Season of Good Will and The Mighty Quinn, by Nemo Blank, Vincent first hurts Jane by not even remembering her name but later makes amends by telling her about the Lane family and promising to pay Jane through college. This page was last edited on 21 August 2012, at 08:11.